New England Patriots To Face Philadelphia Eagles At Super Bowl : The Two-Way The Patriots pushed past the Jacksonville Jaguars, 24-20 for the AFC championship. In the NFC, the Eagles dominated the Vikings for a 38-7 win. 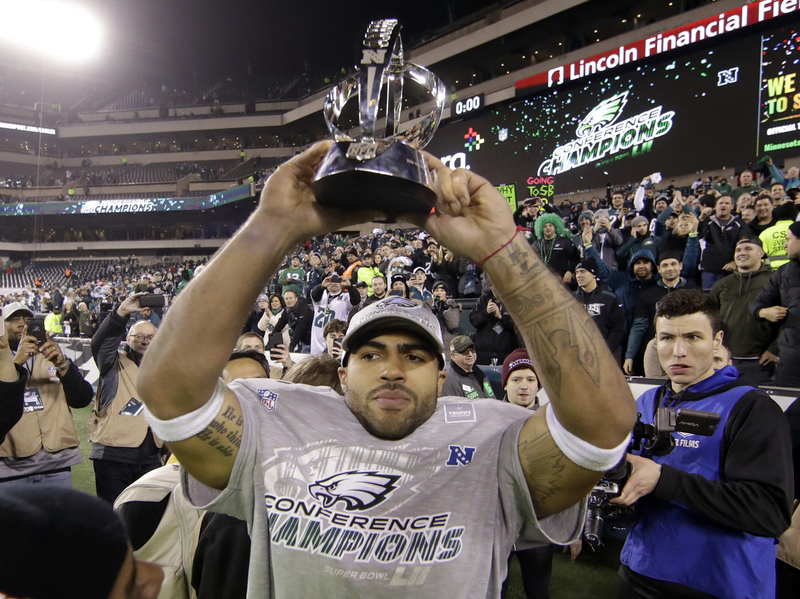 Philadelphia Eagles Mychal Kendricks holds the George Halas Trophy after the NFL football NFC championship game against the Minnesota Vikings yesterday in Philadelphia. The defending NFL Champion New England Patriots will face the Philadelphia Eagles at the Super Bowl on Feb. 4 in Minnesota — setting the teams up for a rematch of their 2005 league championship contest and giving Philadelphia a chance to avenge the sting of that loss. New England quarterback Tom Brady rallied his team in the final minutes for a comeback victory against the Jacksonville Jaguars in the American Football Conference championship. Brady threw a 4-yard touchdown pass to Danny Amendola with just 2:48 left on the clock, putting the Patriots at 24-20. 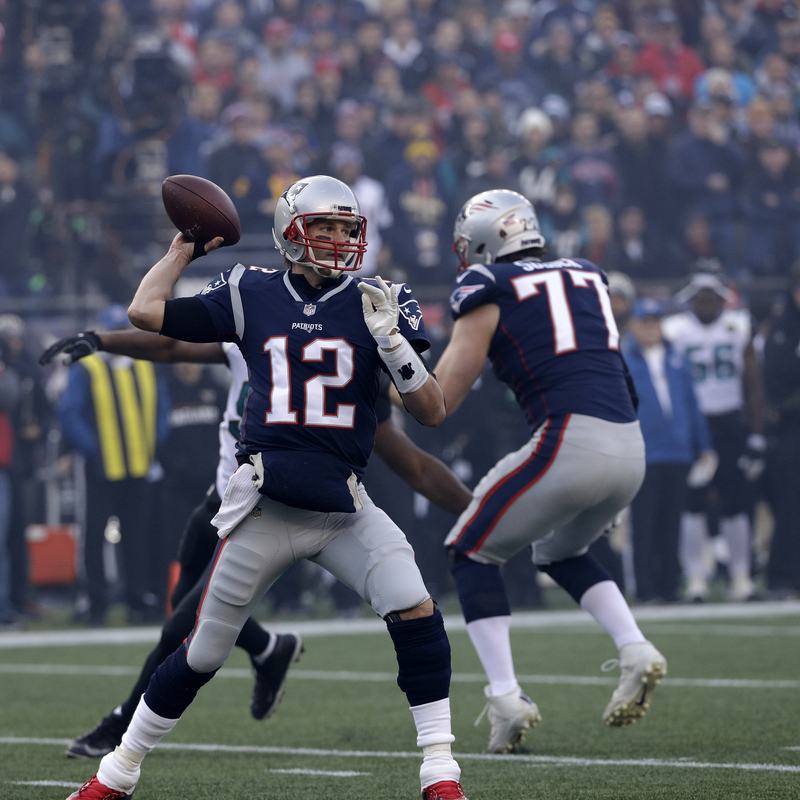 New England Patriots quarterback Tom Brady throws a pass during the first half of the AFC championship NFL football game against the Jacksonville Jaguars yesterday in Foxborough, Mass. The Associated Press notes: "Brady, who was questionable for the game with a right hand injury, showed no ill effects and completed 26 of 38 passes for 290 yards and two touchdowns, including the big one on the Pats' five-play, 30-yard drive in the final minutes." Later, the Eagles overcame the Minnesota Vikings as Philadelphia's quarterback Nick Foles tossed three touchdown passes, chalking up an unassailable 38-7 lead against the Vikings for the National Football Conference title. "The Vikings looked to tie the game — or at least kick a field goal — late in the first half, but [quarterback Case] Keenum was sacked by Derek Barnett on third-and-5 from the Philadelphia 16. [Chris] Long recovered the fumble. Foles proved his mettle on the ensuing possession as he tossed a spectacular 53-yard touchdown pass to [Alshon] Jeffery on third-and-10, giving the Eagles a 21-7 lead with 1:09 remaining in the half. Foles was able to move around long enough to be able to deliver the deep pass." "The Patriots kicked off the season as the consensus Super Bowl favorites with odds around 5-2 and, after a few early hiccups, remained the team to beat at Las Vegas sportsbooks for the majority of the season. The Eagles were 40-1 to win the Super Bowl at the Westgate SuperBook in September. They got off to a 10-2 start but lost quarterback Carson Wentz to a knee injury in early December. Backup quarterback Nick Foles stepped in and led the Eagles to back-to-back wins in the playoffs. Philadelphia was an underdog in each of its playoff games, against the Atlanta Falcons and Sunday against the Vikings."